I want to thank Laura for working with me on guest posts and allowing me to write on for her beautiful blog. I am super proud of Laura for how far she has come in such a short amount of time, this is already one of my top blogs to read every week. 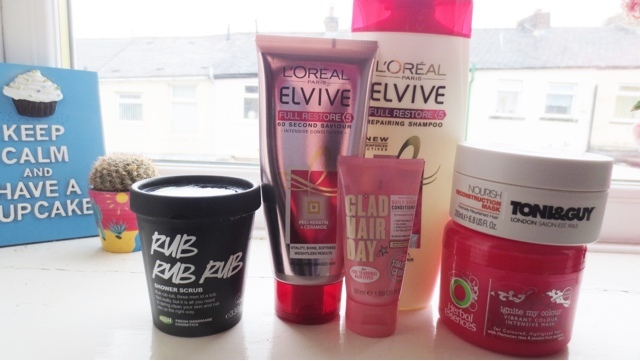 We have worked on a post each about our favourite hair car products, it seems we both love to try new products that really look after our hair. Shampoo: To start with you have to have a good decent shampoo, I am forever trying out new shampoos and changing them up. I always use my shampoo up before my conditioner so I reach for a new brand or something to try it out but this time I have stuck with this lovely product from Elvive. I think it is a great product for coloured hair, I recently have been trying to go back to my natural colour but this needs treatments such as stripping the hair of my dark colours. This product has kept my hair looking and feeling well looked after and manageable due to having my hair highlighted. I have been using this shampoo more often than any other one, I purchased my first bottle of it in May. Conditioner: My hair has been through a lot when it comes to colouring it, I have for years been a very dark brown but since trying to go back to my natural hair colour it has needed extra care. The treatments I need to have and the highlights make my hair very dry but I have a few miracle hair products that have really done the job. Toni & Guy are a brand that I know will work wonders on my hair. This hair mask I have been using since February and it has been a dream, it leaves my hair silky soft and shiny which is what I want. The product itself sits well on the hair and when I apply it onto my hair I wrap a towel around my hair whilst still in the bath to keep the heat in. This helps to work the product into my hair more, it really works. It also feels like a really lovely pamper night trick. 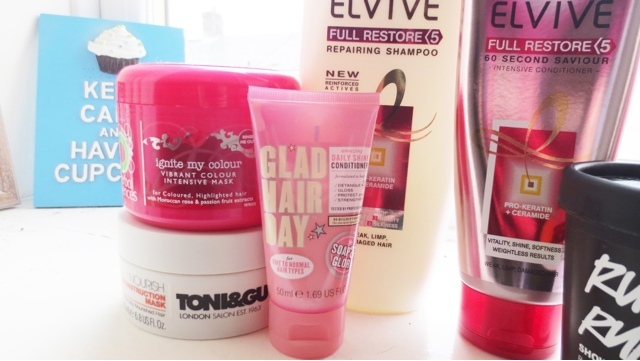 For conditioner Elvive is a go to brand for me, it restores my hair and cares for my coloured hair. Glad hair day is something I purchased when my hair felt very knotty, since having highlights I find my hair gets dry fast so using this whilst brushing my hair in the bath helps to work the knots out my hair. It smells great too and I can trust Soap and Glory, it is my go to products. I guess you are wondering why I have a Lush product in this, well I can share that if you add this Rub Rub Rub product into your hair after conditioner it leaves it feeling beach ready. It has sea salt in its ingredients so it works wonders to help your hair feel all beach ready. I enjoy using this as a fun product, it smells and looks great too. I need to try the Toni and Guy mask it sounds perfect for my hair! Thank you Laura for letting me guest post on you lovely blog!